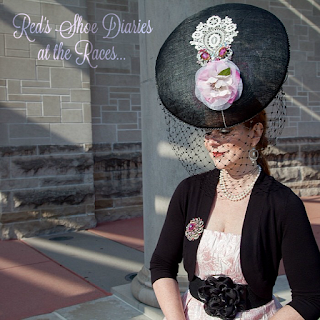 Why, yes, I did just wear this hat to the Kentucky Oaks last weekend in Louisville. 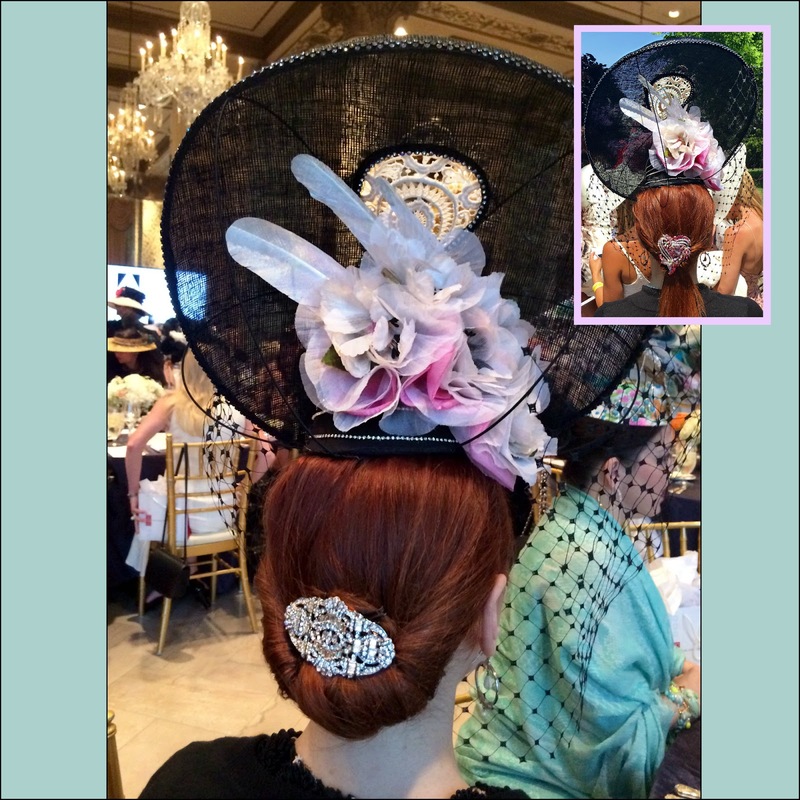 But no, I don't feel a bit bad about wearing it again yesterday for the Service Club of Chicago's annual Hat Luncheon. In fact, I was thrilled for the opportunity to style it differently and enjoy the magic of it for the second time in less than a week. 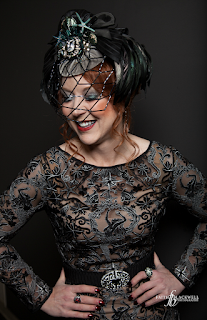 Who knew a chapeau so striking could be so versatile?! 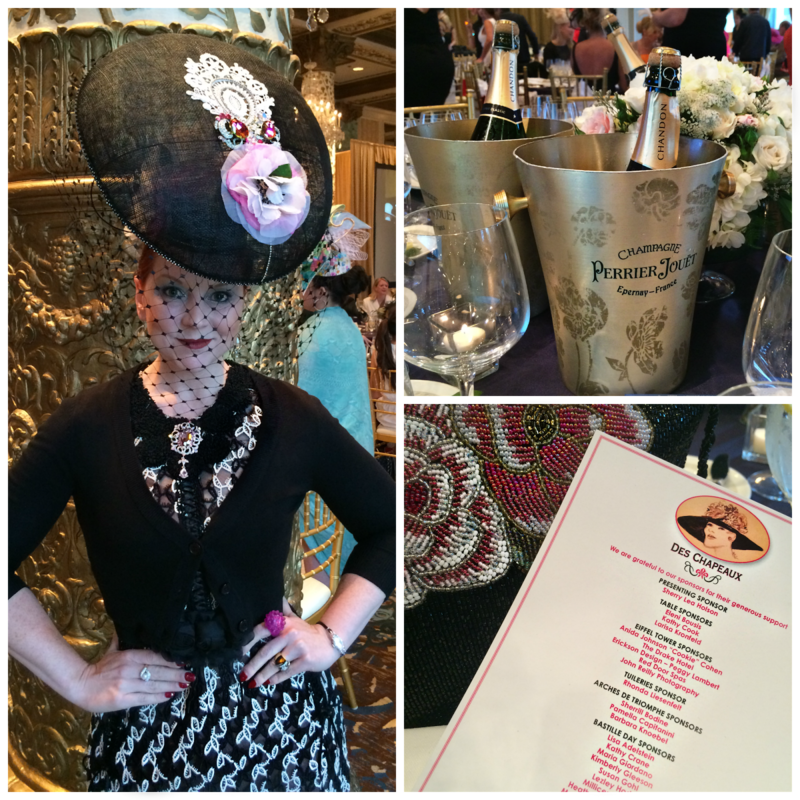 The luncheon had a French theme, and the bubbly was chilled and flowing. I switched out my fit and flare, pale pink jacquard Oaks day dress for a Byron Lars Beauty Mark number in heavily embroidered black and ivory lace. It's a favorite dress from one of my favorite designers (and found at my favorite local boutique, no less). I've worn it many times. Still, it felt brand new paired with the show stopping hat, whose ivory lace inlay echoes the lace that trims the hem of the dress. My Oaks day ensemble (left, photo by Faith Blackwell Photography), played up the hat's pink flowers, while the ensemble on the right highlights its vintage lace inset. Interestingly enough, the hat's Chicago-based designer found that striking piece of antique lace at the Midland Art and Antiques Market near downtown Indianapolis. I wish I knew more about its history, but I love that it's found its way back to Indianapolis. Truly, this hat was meant for me. This was my first attempt at an updo like this, and I was pleased with the result. 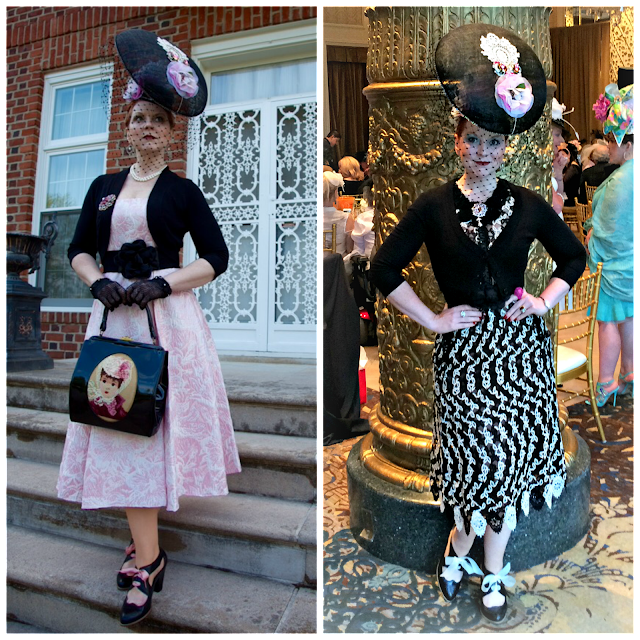 The inset photo is the low pony I wore on Oaks day with a different brooch that played up the pink. I also swapped out my Oaks day pink satin shoe laces for ivory organza ribbons, and surprised myself when I managed to secure my hair in an updo accented with a vintage crystal brooch that looked almost professional (on Oaks day I went with a "topsy-tailed" low pony). 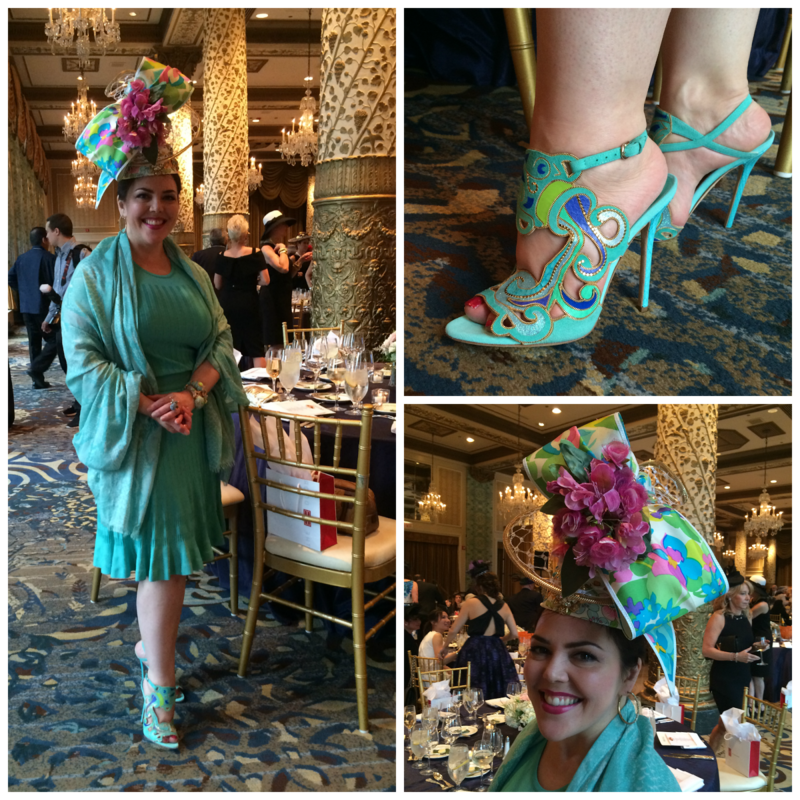 Milliner Loreta Corsetti looks divine in a creation of her own design featuring vintage 1960s fabrics, and I was mooning over her Brian Atwood heels. 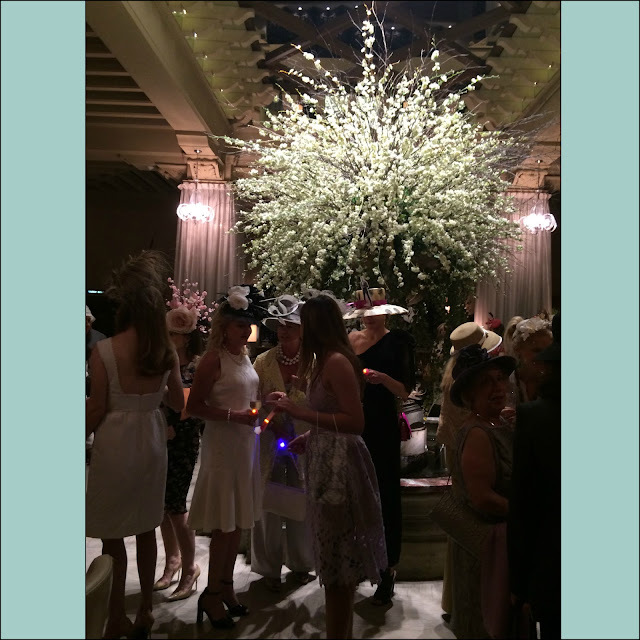 The luncheon itself was a grand affair for 300 held in the Gold Coast ballroom of Chicago's historic Drake Hotel. 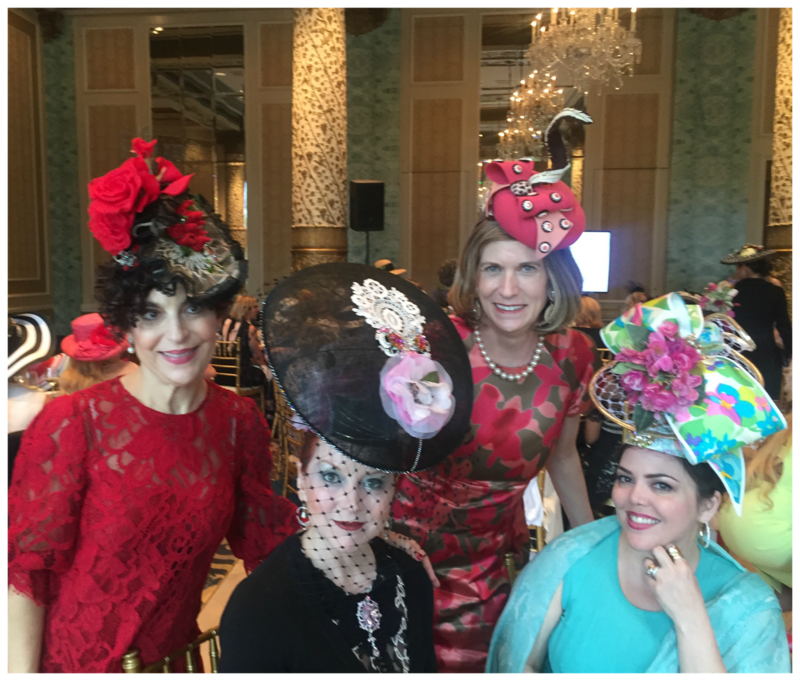 It's hard to imagine a more beautiful setting, and I was thrilled that rock star milliner Loreta Corsetti invited me to attend. The ensembles and headwear on display created a visual feast that rivaled the sumptuous meal and crisp bubbly we enjoyed while raising critical funds to further the nearly 130 year old Service Club's philanthropic mission. 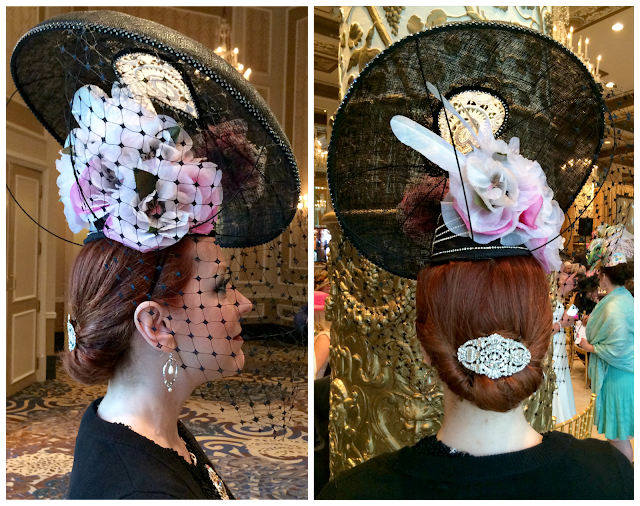 Four little (and not so little) Loreta chapeaux all in a row! Her designs are all one of kind. Loreta's hats were, of course, among my favorites, and there were several of her designs gracing the room, along with those of other contemporary milliners both local and abroad; vintage designs from the likes of Elsa Schiaparelli and Christian Dior; and a few homemade creations. 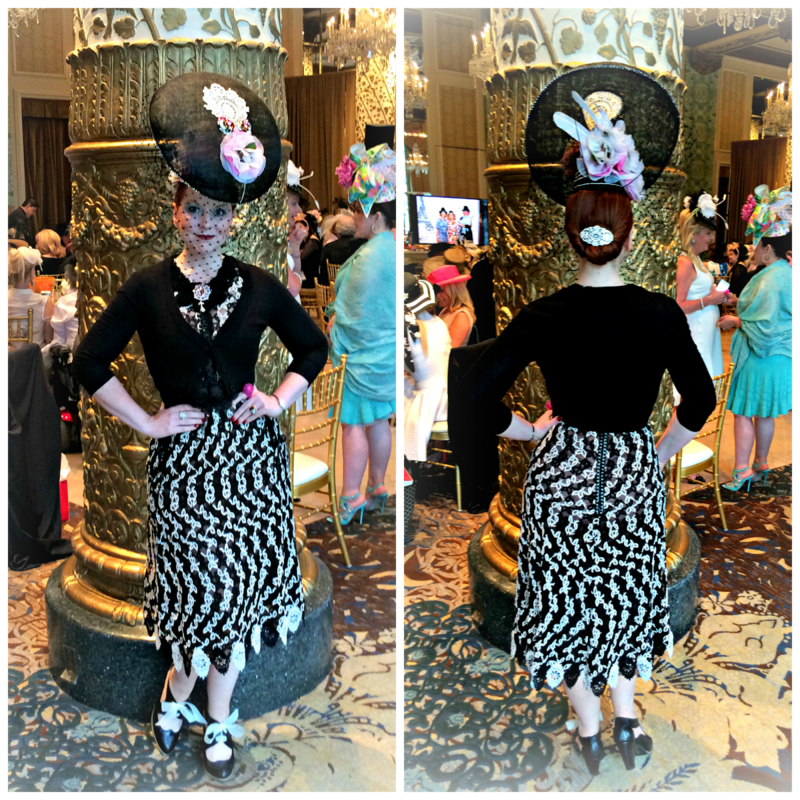 As if an afternoon sipping champagne for a good cause and forging new friendships wasn't enough, I was surprised and honored to be awarded the best-dressed award! My prize was a private wine-tasting party for twenty friends, so I'm looking forward to a return visit to the Windy City in the near future for a toast with friends both new and old. Luncheon guests gathered in the iconic Palm Court at The Drake for champagne and conversation before moving into the Gold Coast Ballroom.